The magnificent flood-lit Piazza del Duomo (cathedral square) with the Palazzo Vescovile in the baroque city of Lecce as seen at the blue hour. 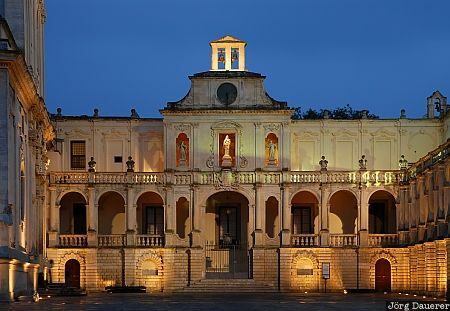 Lecce is in the center of the Salento peninsula in the province of Lecce, Apulia (Puglia), Italy. This photo was taken in the evening of a rainy day in April of 2006. This photo was taken with a digital camera.